Diaspora Blac (cq) performs during Mustock. At left is Baba Femi and at right is Mr. Seifu. Photo credit: André Chung. This story first appeared in our Winter 2017 print magazine and online in April. Mustock takes place July 20 - 22, so we’re sharing André Chung’s account of this unique event again. Mustafa Akbar is a great host. For the past 17 years, the Washington D.C. based musician has invited family, friends, and fans of great music and good times to his property in Lignum, Virginia for a weekend of chill vibes, late nights, and good company. Dubbed Mustock, the festival has its origins as a fish fry in 1998, when his mother, Mary Frances Holmes, was still alive. That first time, they just bought some food and hired a DJ to spin at the family property. Somehow the small event managed to evolved into a music festival. LIGNUM, VA -- 7/23/16 -- Rose White, of DC, laughing happily during her first visit to Mustock. Photo credit: André Chung. Mustock happens every year in late July. The family-friendly atmosphere encourages people to make friends and enjoy simple pleasures like the late night bonfire or a game of spades. In truth Southern style, the pace is slow and deliberate, with the energy ebbing and flowing throughout the weekend. People start showing up on Friday to camp. There's a long, manicured lawn, circled by a stand of trees that provide some shade. "My yard is pretty fly," Mustafa grins. "Take a sister to a golf course and pitch a tent and it's more likely she'll sleep in it than if it was the woods or a cow pasture." LIGNUM, VA -- 7/23/16 – Doc cools out on his bike. He has been coming to Mustock for 9 years, and takes it very seriously. Photo credit: André Chung. The camping isn't really roughing it, as most people pull out all the stops and "glamp" instead. "Glamping" is shorthand for "glamorous camping," where one brings as many creature comforts as possible to their tent. Many folks lay out carpeting and have real furniture in the front rooms of their massive tents. Archie Newman, who has been a regular for 10 years, brings his whole bedroom set, complete with nightstands, every year. LIGNUM, VA -- 7/24/16 – Archie Newman, aka “Doc” or “Witchdoctor” pauses for a photograph inside his tent complete with full bedroom set. Photo credit: André Chung. The music starts up after dark on Friday, and the party goes into the early morning hours. Often, the bonfire doesn't get lit until after 3 a.m., once the mood is just right. Mustafa lines up a great set of bands, who all play for free because the party is so good. 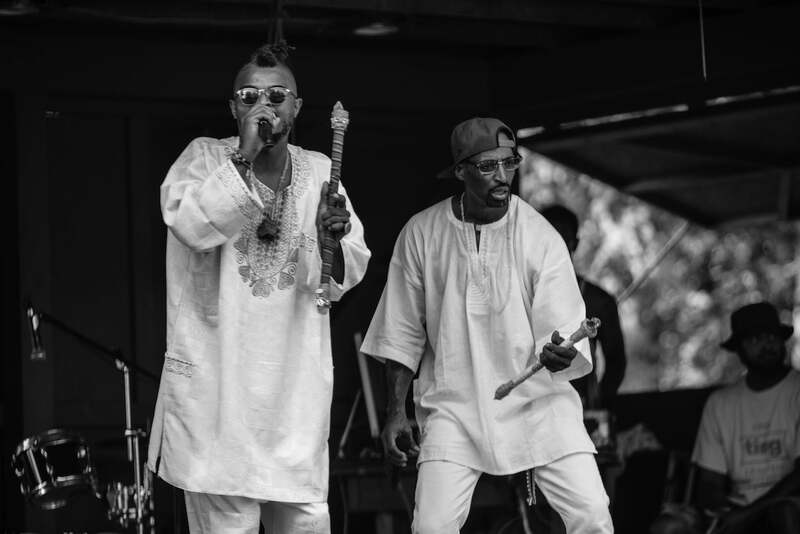 A fixture on the D.C. music scene for the last two decades, Mustafa is a veteran of the Eighteenth Street Lounge scene, where ESL Music has been responsible for such acts as Thievery Corporation. Mustafa used to work at a club owned by Thievery's Rob Garza and Eric Hilton, where he was discovered by renowned DJ Thunderball. He has recorded with a host of other musicians and producers from around the world, and stays active with his own projects. Mustafa's band, Nappy Riddem, plays their dancehall funk set early Saturday night, then gets out of the way for the other bands. LIGNUM, VA -- 7/23/16 -- Aljean Lee, guitarist with Adwela and the Uprising (center, pointing), laughs as he and other attendees groove on a sweat-soaked evening. Temperatures remained in the high 90's with a heat index over 100º all weekend. Photo credit: André Chung. LIGNUM, VA -- 7/23/16 -- Ardarius Williams, of DC, enjoys himself during one of the shows at Mustock. Photo credit: André Chung. By Sunday everyone has been reset. The party is winding down, and people are relaxed and feeling better about life. As people pack up and get ready to leave, no one says "goodbye;" they use the salutation of choice,"MUUSTOCK!" André Chung is an award-winning photojournalist and portrait photographer whose work explores people of color and their relationships. He has created images for The Washington Post, NBC News, Ebony, and Apple. His work is included in the permanent collection at the Smithsonian’s National Museum of African American History and Culture.